Happy Tuesday everyone... March is National Craft Month and a few of us are joining in along with Nicole over at Right at Home for a fun Blog Hop to celebrate and showcase some of our favorite Crafting products!! For my project I'm using a lot of my favorite products.... I love Nicole's Stamps in the Right at Home line so I decided to use Fall Leaves and Fall Sentiments. This is one of my favorite layouts to use as well.. I'm a hug fan of all the Stitched dies on the market especially the Wonky ones. I used the Stitched Wonky dies from MFT along with a the Gingham Background stamp. I used all Lawn Fawn inks and a stitched banner die from Avery Elle. There's some Natural Twine in a nest behind the leaves and a few of my absolute favorite.. the Sparkling Clear Sequins from Pretty Pink Posh. So what are some of your favorite crafting products to use? Head over to the Right at Home blog for all the details on how to Win some great prizes! Up next on the Hop is the Fabulous... Kari Webster. Ooohhh...love your choice of colors and all the pretty die cuts! Very pretty! I always love seeing non traditional colors with "seasonal" stamps.. So versatile! Love that aqua gingham in the background!!! Gorgeous! Love these wonky stitching with soft gingham BG! A pretty creation! Love those colors! That wonky stitched background is so fun too! Love the turquoise!! And the plaid! I love the die cuts you used and the colors are really pretty! You had me at gingham! Lovely card, I really like the layered background. So pretty! I love that background too, awesome card. What terrific layers and colors! There is so much to love on this card. The layers of leaves, the background color, the background itself & the wonky stitch frame. Awesome sauce! Great card love the bright colors so pretty for spring. The background is perfect for your design! and the fun gingham background! I love that you used a fall stamp but by changing things up made such a lovely spring looking card! That gingham background stamp makes my heart pitter patter! I must get it! I adore coloring with both Copic markers and colored pencil, I love image stamps and using my MISTI! Your cluster of floral images is wonderfully pretty; the gingham background is *the* perfect canvas! Thank you! Really lovely card! Love the cluster of stamps and the background. So clever using fall leaves with a "springy" touch! Love this card, especially the background. I love my Misti, best thing ever! Yes! Stitched dies are one of my favorites these days too.....love this card! what great leaves. Love the colour scheme and the design. Lovely card, great layers! Love the gingham!! 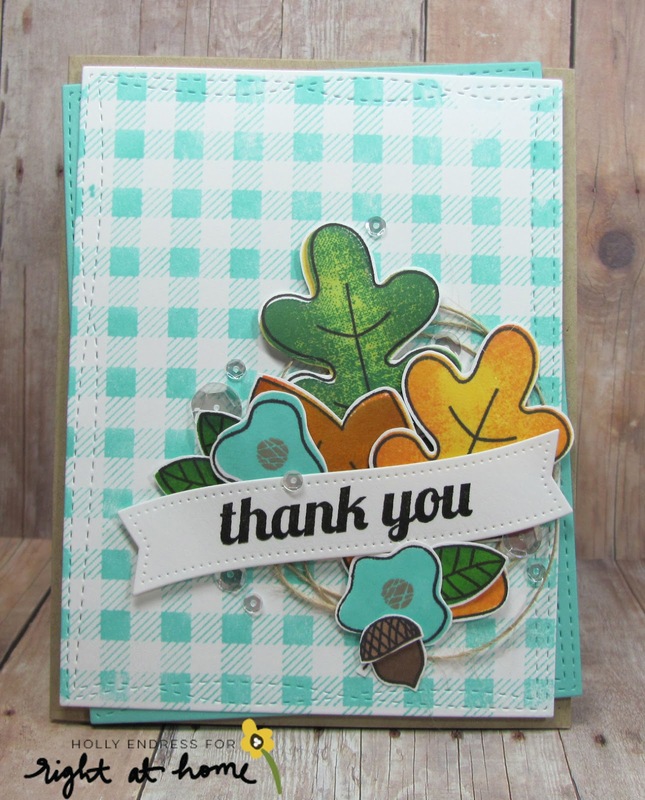 LOVE your gingham stamping and colour combo, LOVE your wonky stitching and layered leaves too!!! I love the gingham background stamp also (and the stitched border)... Those are must-haves! I'm loving all of the layers here, with the diecut leaves! And that gingham stamp is so fun! Is it bigger than the gingham backdrops set from Lawn Fawn? I have that one (and love it! ), but would love a larger version, too. I love the stitched dies, too. Love the cluster of elements in the corner with the gingham base. This is adorable and love the cluster of fall leaves together with the gingham background! Love the colors you picked for this!! Beauty!! Great card! I love the Wonky stitched die cut and the twine behind your leaves and sentiment! That aqua gingham is such a fun base for your pretty leaves & flowers! Fun card! Love those whimsical stamped images, the gingham and the wonky stitching details!! The colour combo of this card is really lovely, and all the elements are nicely tied together! Your gingham background is perfect for your leaf cluster and sentiment! Great card! I loke all the layers. Gorgeous love the bright blue background! Thanks for sharing your fantastic card. LoVe the colors and design. Gorgeous card with those leaves! Oh I love your layering work, too!